Diam 24 one design / General / Imminent take off for the World Diam Tour 2019 ! Imminent take off for the World Diam Tour 2019 ! After the success of the 2018 edition, the World Diam Tour is launched again this year and starts as early as the 2nd February at Oman with the Sailing Arabia The Tour. Last year’s winner team – Oman Sail – will be present to defend its title and to show its Gold World champion sail-headpiece. Powerful contenders are also in the starting-blocks with Cheminées Poujoulat (Bernard Stamm), vice-world champion andBeijaflore (Valentin Bellet), third. The Oman event will end on the 17th February in Salalah in the south of the country. After the middle-East, the world circuit will resume in Europe. The Tour Voile in July will be, as usual, the main event with around 30 boats listed. The contenders will then move to Italy for the first edition of Nastro Rosa. TheTour d’Italie will be made of 6 stages round the peninsula. 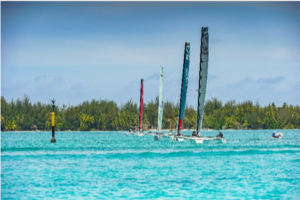 Like last year, it will be in the Turquoise polynesian waters that the Grand Prix Pacifique des Jeux will be held, the second World Diam Tour last act.